The Volkswagen Group is one of the largest automotive manufacturers worldwide. Their automotive division comprises both passenger cars and commercial vehicles. The Group manages 12 brands including VW, Audi, Bentley, Skoda just to name a few. 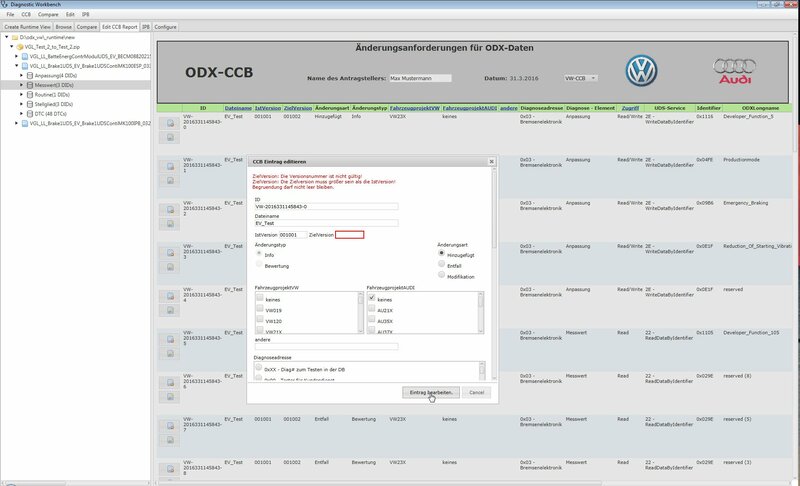 The Volkswagen ECU developers and developers of test programs need to know the influence of their ODX data changes regarding the MCD Kernel runtime. Up until now there was no automated way of doing this. Developers spent lots of time analyzing and solving problems. As this was done manually, there was also the human error-factor risk. The creation of ODX change requests was done manually, therefore it was time consuming. The visualization of the runtime data changes enables developers to improve their work process. It helps to identify the consequences of ODX-data changes in the runtime data. The tool also enables the fast creation of ODX change requests by using the identified runtime data changes, and importing them into a standardized template. This concept ensures efficiency in terms of time, costs and quality. More than 5 version releases were delivered in the last year and we continue to further develop this tool together. Thanks to this valuable tool, the VW ECU developers save valuable time which lets them concentrate on more important issues such as the integration of new features.